I do hope you're enjoying these lip posts. Today I have another of my faves for you. Chanel - Venus. 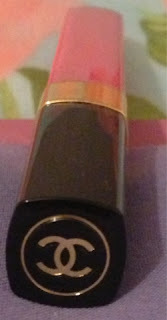 This lip gloss is the most indulgent piece of make-up I own but I nabbed it in the duty free in Dalaman last year. I use it sparingly cuz even at duty free prices it cost me close to £20! It is however totally worth it. It goes on lovely and smooth, it's non-sticky. The colour is nice and bright but not in your face and it has a subtle shimmer (that was hard to photograph). Also as lip glosses go it is very long lasting and doesn't dry your lips out. I love this so much that I would be willing to pay full price when the day comes that this runs out. What's your most indulgent make-up item? Day 10 - Trick or Treat! Wow! 100 Followers = COMPETITION TIME! Wendy's Delights: 200 Follower Giveaway - yay!!!! NOTD: Essence - Oh My Glitter!